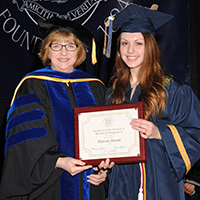 Cazenovia College's 192nd Commencement ceremony on Saturday, May 13, featured several academic awards, recognizing the accomplishments of outstanding students in the 2017 graduating class. These individuals are shared below. 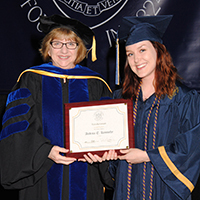 The Academic Excellence Award in the Division of Art & Design was awarded to Andrea Kennedy of Fayetteville, New York. In addition to receiving this award, Kennedy was also the valedictorian for the Class of 2017. She earned a Bachelor of Fine Arts in studio art while also completing minors in art history, 3D studio art, and philosophy—all while maintaining an impressive 4.0 GPA. Kennedy was awarded the Washburn Research Fellowship. Her paper and accompanying photographic exhibition titled 'Exploring Gender' raised important questions about social constructs and identity. The Academic Excellence Award in the Division of Business and Management was awarded to Theresa Staats, of Montrose, Pennsylvania. She was a business management – fashion merchandising major with minors in business, fashion design, and international studies. In addition to balancing her full-time course load, Staats owns and operates her own business. She has committed herself to her professional development by seeking out many internships in the events and bridal-services industry. Staats used these experiences to set herself up for employment in a bridal boutique upon graduation. 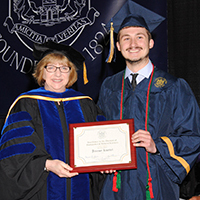 The Academic Excellence Award in the Division of Humanities and Natural Sciences was awarded to Jeremy Kuettel, of Oneonta, New York. He was a top student in each of his classes, completing 139 credit hours with a GPA of 3.857, and on the dean's list every semester. Kuettel is member of both the Tri-Beta and Alpha Lambda Delta Honor Societies. In addition to his outstanding scholarship, he was a master student for a first-year seminar course and worked as a tutor in the Academic Learning Center. He also played soccer and served as the captain of the Cazenovia Men's Soccer team. Kuettel's career aim is to become a doctor, having obtained a degree in biology with a minor in health care management, He also completed a summer internship at the Roswell Park Cancer Institute in Buffalo, NY. Kuettel's research topic—"The Role of b-Adrenergic Signaling in Tumor Cell Energetics and Radiation Resistance"—helped with cancer treatment methods. 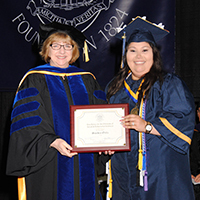 The Academic Excellence Award in the Division of Social & Behavioral Sciences was awarded to Sandra Ortiz of Brooklyn, New York. Ortiz was a psychology major with minors in human services and international studies. She volunteered and interned with the Madison County Department of Social Services and the Community Action Partnership in Oneida. In both organizations, Ortiz served as a translator and source of support for families in need. She went on to study in Canterbury, was a student government representative, and a Campus Key tour guide. Ortiz was active in the Psych Club, Human Services Club, and Leadership Honor Society. She was recognized as a Who’s Who Among Students Honoree. Ortiz has been accepted to Columbia University where she will pursue a masters in social work. 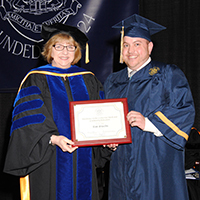 The Academic Excellence Award in the Center for Adult & Continuing Education was awarded to Rod Shields of Troy, New York. Shields has worked in the human services field for more than 15 years with clients in a variety of settings—treating individuals with developmental disabilities and mental health issues. Currently, he works as a vulnerable persons protection specialist where he evaluates abuse and neglect allegations. Known as a person of integrity and a competent and accomplished human services professional, Shields was promoted several times throughout his years of work experience. He has excelled in the classroom, at his internship, and on the job. This fall Shields will begin the Master of Social Work program at the University of Albany. 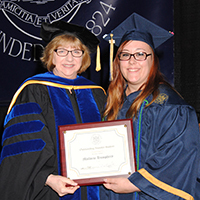 The Academic Excellence Award for Outstanding Transfer Student was awarded to Mallorie Humphrey of Cicero, New York, who came to Cazenovia College from Onondaga Community College. Humphrey was a human services major with a specialization in mental health counseling. With a GPA of 3.9, she has been on the dean's list every semester. Humphrey is a member of the Alpha Chi and Tau Upsilon Alpha national honor societies. She completed an internship with Access CNY in a day-support center for adults with chronic and severe mental illnesses. Humphrey's senior research project focused on the importance and effectiveness of complementary alternative medicine and holistic approaches to address physical and mental illnesses. She will continue on for her master's degree in clinical mental health counseling, intending to have her own counseling practice utilizing holistic approaches to improve people's lives.